For the second time, I’ve been privileged to be chosen as part of a review for the Crew for Heirloom Audio Productions. This time, we received the 2-CD production With Lee in Virginia and accompanying download link for a great study guide. When Heirloom Audio came up for review again this year, after having reviewed a different Henty production for them last year, I all but begged to be on the review. 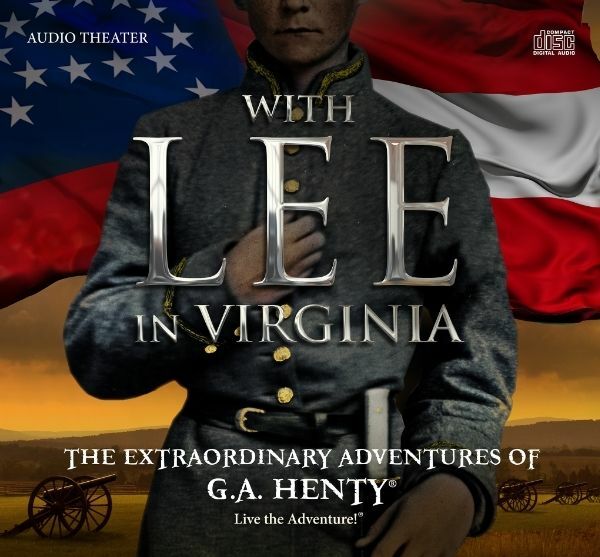 Heirloom Audio Productions, performing “The Extraordinary Adventures of George Alfred Henty”, in drama form like none I’ve ever experienced, is downright amazing. With stars like Jim Weiss (Greathall Productions), Chris Anthony (Adventures in Odyssey), Kirk Cameron (Fireproof), Sean Astin (Lord of the Rings), and Kelsey Lansdowne (Curious George), With Lee in Virginia is no low-budget production. It’s brilliantly done, with nothing short of fabulous sound effects, voices, and excitement. We loved it! Last year when I reviewed Heirloom Audio, we had a 10 hour road trip planned. We popped it in and passed hours in fabulous style, and the miles flew. This time, I had just gotten home from the same ten hour drive, so I wondered when we’d be captive for two and a half hours for this. When opportunity didn’t completely present itself, I ended up putting it in one rainy day with the intention to begin listening to a chapter or two at a time. Instead, I found myself parking my sewing machine on the coffee table so that we could continue to listen. The kids never left the room – the break between CD’s became a brief intermission for a bathroom break. It was hilarious! We were all enthralled. Liberty (12) and Eden (10) were by far the best listeners and most able to understand, but the others didn’t stray far. This is rated for 6 and up and while Ruby is 6 and Sterling is 8, and neither was as enthralled, 2 1/2 hours later, but they did ask a lot of questions so clearly they were still getting quite a bit out of it. The study guide has 52 pages and contains Listening Well, Thinking Further, and Defining Words for each chapter, along with a reading book list for further study and a short Bible study guide discussing duty and slavery in the Bible. It helps comprehension for younger listeners, and retention for all listeners. Since we listened to it in one (2 1/2 hour) sitting, we didn’t spend much time with it, but reading through it, I think we might listen again, slower, to be able to discuss much more. I can’t recommend these Audio dramas enough. Heirloom Audio blew me away with Under Drake’s Flag last summer and did it again with With Lee in Virginia. They start with quality literature from G.A. Henty and turn it into a grand adventure to listen to again and again. It provided a fabulous beginning for a great discussion on slavery, the Civil War, and Robert E. Lee’s fight for state’s rights – along with duty and honor and being willing to fight to the death for a cause you believe in. Awesome. Simply awesome. Find With Lee in Virginia on Facebook. Find Heirloom Audio Productions on Facebook, Twitter, and Google+. Well, after all, what could be more interesting than Virginia’s fine history? My uncle (many times back) was Lee’s aid-de-camp, Charles Marshall. I lived that history (literally) when I was a teen doing reenactments. So glad y’all enjoyed it. Sounds like a must for us when the kids are a little older!